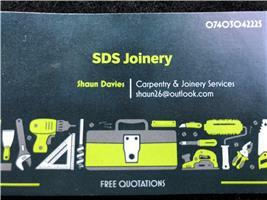 SDS Joinery - Carpenter based in Baldwins Gate, Staffordshire. Hi my names Shaun Davies I’m a sole trader and owner of SDS joinery. I've been a carpenter for 16 years and undertake all aspects of wood work. I specialise in laminate floors and doors. I’m not as they say a one trick pony as I also do stud walls roofs,joists kitchens door frames sheds porch roofs skirting boards architraves basically if it’s in your home and timber I’m capable and trained enough to complete the job. I’m willing to travel anywhere up to 40 miles from my postcode which covers a large area of the midlands.